I have found myself plaugued lately by a list of things I want to do much longer than the amount of time I actually have available in which to do them. This is to say nothing of the things I am supposed to be doing, but don’t necessarily wish to do. It’s been a little nutty at work lately (on multiple levels and for multiple reasons – the latest being a whole office computer & software upgrade), so when I’m at home I’m not really inclined to do anything that might entail work or thinking. You would think that this would mean more time spent knitting, but somehow, the reverse has been true. I’ve spent much more time reading lately, than I’ve done in a long time. This would be a positive, except that too much of that reading has been for studying (which I absolutely despise). I seem to keep getting pushed and pulled between the wants and the needs, and I’ve found myself knitting almost exclusively on the weekends. My progress has been very limited, alas. I keep trying to see where I can cut, what I need to do to find my free time again, but it isn’t working as well as I would like. Finding the balance of doing all that I need to do and all that I want to do is presently eluding me. However, I have decided that one thing I really want to do is become more faithful to this blog. I started it in part because I wanted to force myself to spend time writing, to continually have that practice of putting thought to paper (even if it’s just about knitting!) that didn’t involve architectural notes or specifications. Further, Seasons of Lace (Autumn) started this past week, and seeing all the lovely lace knitting over there really makes me want to knit lace again! 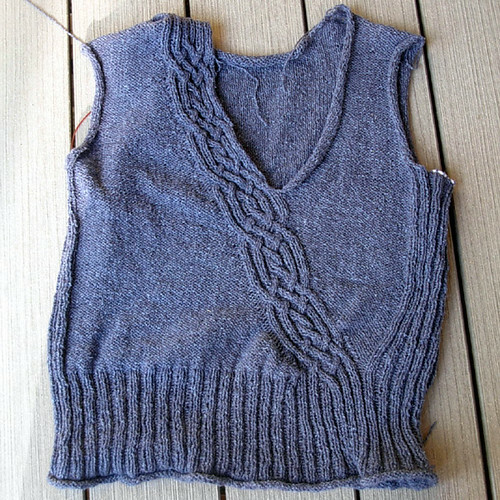 I’ve managed to finish the body, including seaming the shoulders. I’ve even tried it on, and I think it fits! (Although, I’m thinking maybe it would have been nice if it were a little longer. If I decide that’s the case, I might try something scary involving snipping out a row and adding more ribbing. I’ll wait until after I block it to decide, though.) I also knit the neckband until I used up that particular ball of yarn. The sleeves are both started – I wanted to get the ribbing done on both to make sure I’d have the exact same number of rows. The first is partway through the increases, but I’ve put it on hold as I’m iffy on the needle size. If I decide I’m going to wear this with a blouse underneath, I may wish to go up a needle size, to give more room in the sleeves. I did learn something unexpected during the body of this sweater. 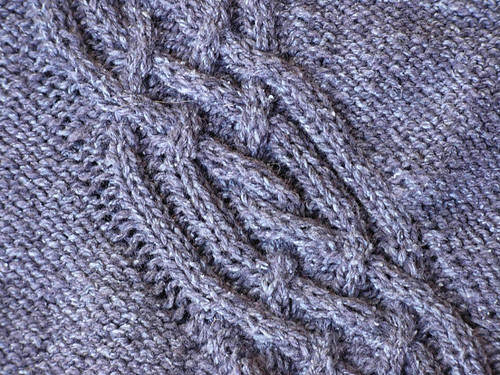 If you look closely at the detail of the cable below, in the lower portion, the first reverse stockinette stitch to the left of the cable is loose. I tried to pull it tighter every row, but it didn’t seem to help. Then, by chance, I read that the Norwegian style purl (YouTube video link) could solve this exact problem. It’s a method of purling intended for Continental-style knitting which leaves the yarn in the back instead of bringing it to the front. I find it a little more fiddly than the method I’m used to, so I won’t use it most of the time. However, as you can see from the upper portion of the picture, it definitely worked. I’ll be back soon with lace. I promise! Can’t wait to see the lace!